The Philharmonic Society of Saint Petersburg is the oldest public musical organization in Russia. It was established in March 1802. 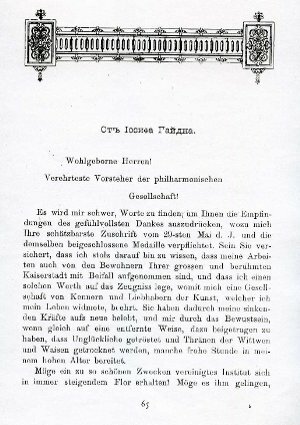 The news about execution in 1801 in Vienna of Joseph Haydn's oratorio The Creation in favour of the Viennese Society of Musicians' Widows and Orphans was an impulse for establishment of the St Petersburg Society. The Petersburg admires of music decided to execute this oratorio with the same charitable purpose. The fees from the first executions of The Creation in St.-Petersburg, taken place in the spring of 1802, have exceeded all expectations. These concerts also became the birthday of the Saint Petersburg Philharmonic Society, which according to the founder and the editor of The Russian Musical Newspaper, N. Findeisen, was 'The first musical society in Russia, which developed artistic taste in the public and accustomed it to complex and large works'. 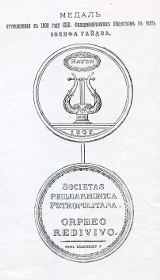 In 1808 the Institute of Honorary Members was founded. It was decided to select those musicians and admires of music as Honorary Members who promoted Institute's purposes. Joseph Haydn was unanimously selected as the first Honorary Member of the Society as the Society was obliged by its birth to him. In honour of the composer it was decided to mint a medal. All the circulation was minted from silver, except for two gold copies one of which was presented to the emperor, and the second was sent to Haydn to Vienna. 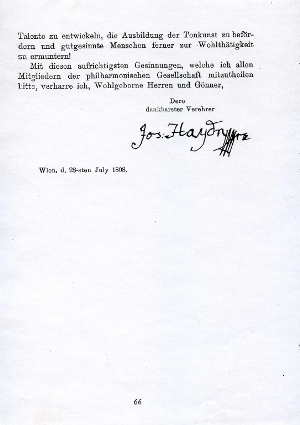 Having received this honourable gift a few months before his death, Haydn answered with the warm letter of appreciation. During the 115 years of its existence, the Society has organized 204 concerts and has acquainted listeners with numerous works of Haydn, Mozart, Beethoven, Weber, Berlioz, Liszt, Wagner, Glinka, Tchaikovsky and many other outstanding composers. As the most memorable events in the history of the Philharmonic Society the following can be named: a premiere of Missa Solemnis by Beethoven; a concert devoted to the 50th anniversary of the Society in which Glinka's overture Night in Madrid devoted to the Society was presented for the first time; a concert devoted to the 100th anniversary of Mozart and a concert, conducted in commemoration of the died honorary member of the Society M.I.Glinka; and also three big Historical concerts, conducted by E. Napravnik. The important marks in the history of the Society were two P. Tchaikovsky's concerts which the composer directed himself, and also the celebration of the 100th anniversary of the Society together with the anniversary concert which took place under direction of A. Nikish. The importance of concerts of the Society was defined also by participation in them of such masters, as conductors G. Paris and K. Albrecht, G. Berlioz and L. Maurer, R. Wagner and G. Byulov, K. Lyadov and A. Rubinstein, E. Napravnik and P. Tchaikovsky; the singers P. Viardot, A. Patti and G. Zontag; violinists L. Auer, F. Beem, P. de Sarasate, G. Veniavsky and H. Vieuxtemps; violoncellists K. Davidov and A. Verzhbilovich; pianists D. Field and K. Schuman; А. and N. Rubinstein, A. Yesipova, V. Safonov, A. Siloti and I. Hoffmann. The list of Honorary Members of the Philharmonic Society gives us the same evidence. During different years J. Haydn and L. Cherubini, D. Bortniansky and O. Kozlovsky, D. Field and brothers Wielhorsky, K. Schuman and F. Liszt, R .Wagner and G. Berlioz, M. Glinka and A. Dargomyzhsky, L. Maurer and G. Meyerbeer, G. Veniavsky and H. Vieuxtemps, L. Auer and K. Davydov, A. Henselt, brothers Rubinstein, P. Tchaikovsky, M. Balakirev and N. Rimsky-Korsakov, C. Cui and A. Glazunov were its members. In 1917, the Society ceased its activity. It managed to start again only 75 years later.